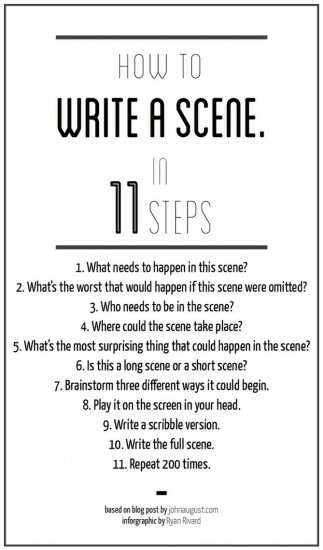 The infographic below, which hit the front page of Reddit tonight, comes from a 2007 post of mine titled How to Write a Scene. 5) Ask: What’s the most surprising thing that could happen in the scene? Give yourself permission to step away from your outline and consider some wild possibilities. What if a car smashed through the wall? What if your hero choked and died? What if a young boy vomited up a finger? Most of your scenes won’t have one of these out-of-nowhere aspects. But your movie needs to have a few moments that are completely unexpected, so always ask yourself, could this be one of them? Great scenes surprise both the reader and the writer. And to clarify the last point (“Repeat 200 times”), I meant write 200 scenes. That is not an uncommon number for a feature.